The intention of the Parallel Project Programme is to expand the scope of the UIA 2014 Congress and use the event as a platform for furthering conversations around the Congress themes and pertinent built environment issues. It also provides an opportunity to showcase South African and specifically Durban talent to an international audience, through events, artistic and cultural items, performances, exhibitions, etc. 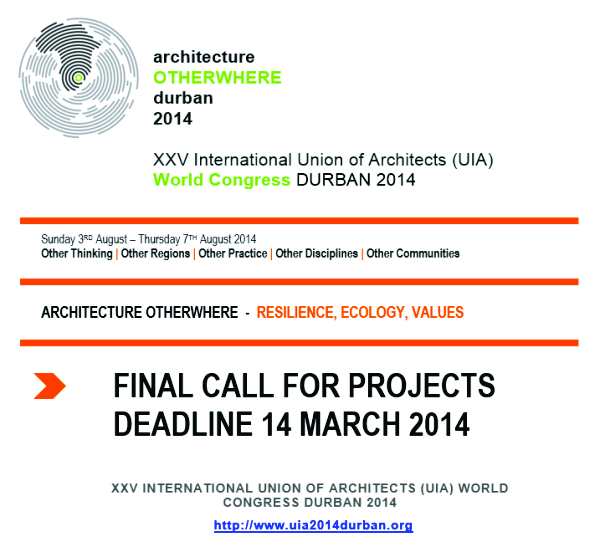 Applications should be made for projects that will take place anytime from the 1-10 August 2014. All approved projects will be included on the official UIA2014 programme and in all marketing material and delegates will be encouraged through to attend.